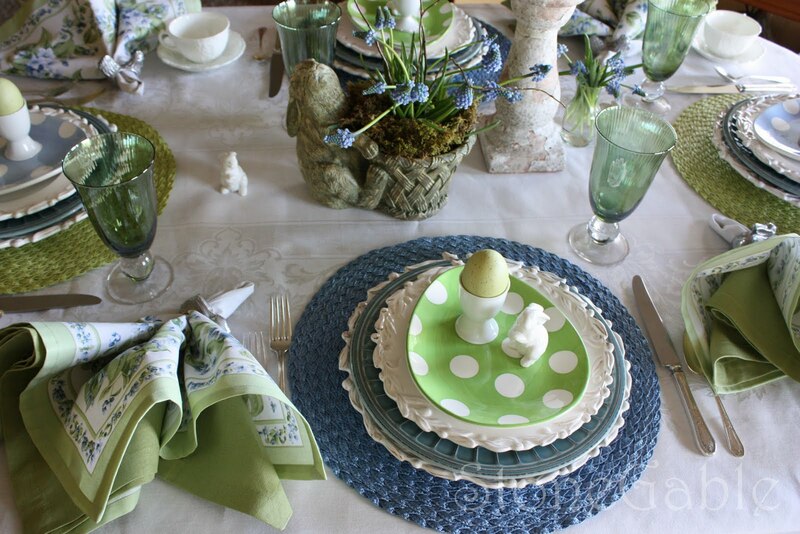 The bunnies have come out to play in this Easter tablescape. 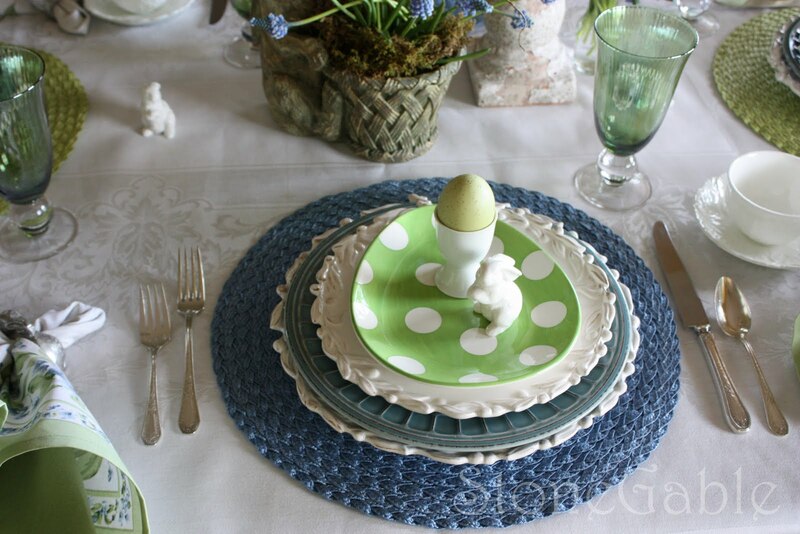 The inspiration for this table are these happy blue and green polka dot egg plates (HomeGoods). 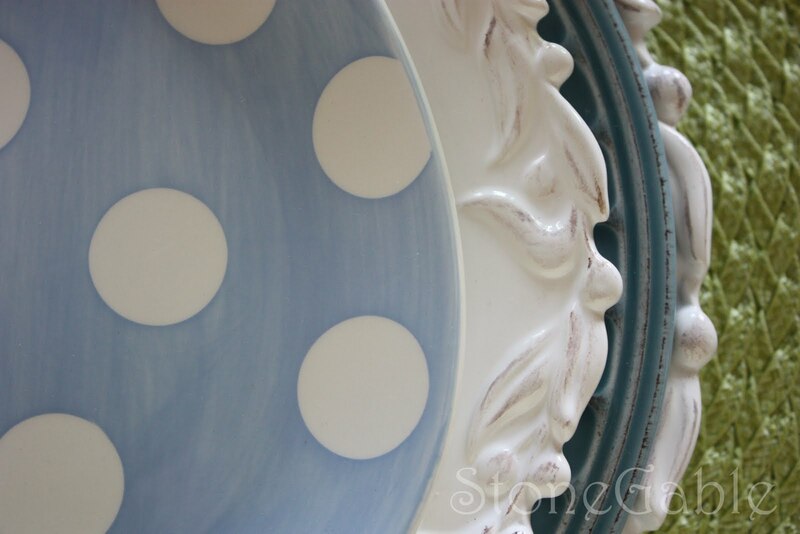 Some colors were just meant to be put together. 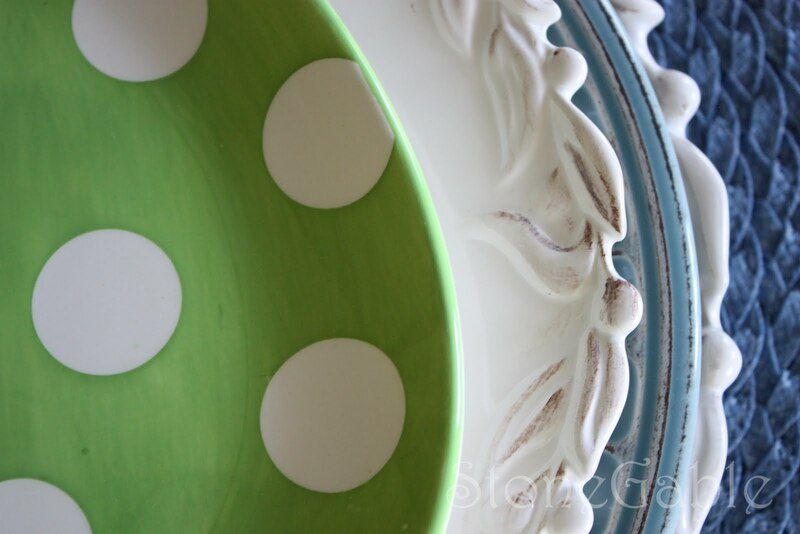 Blue and green are perfect examples of this color pairing. 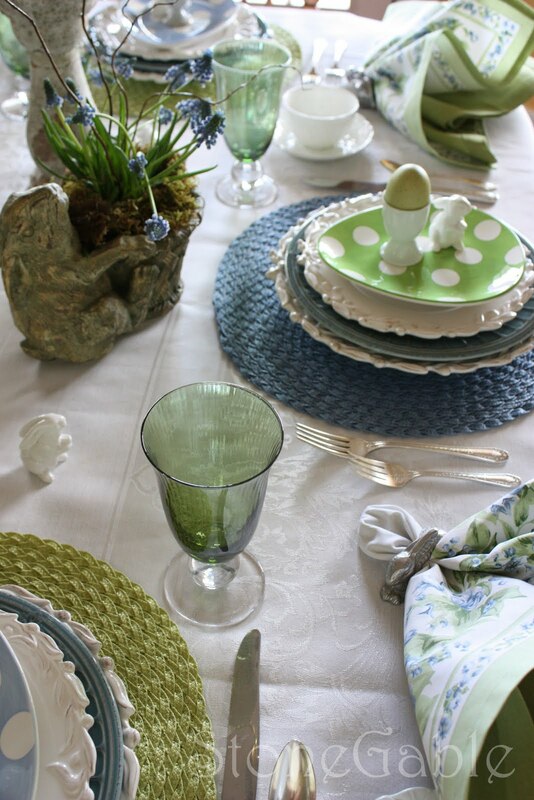 Alternating blue and green at each place setting brings interest to the table and keeps this springtime table fresh. 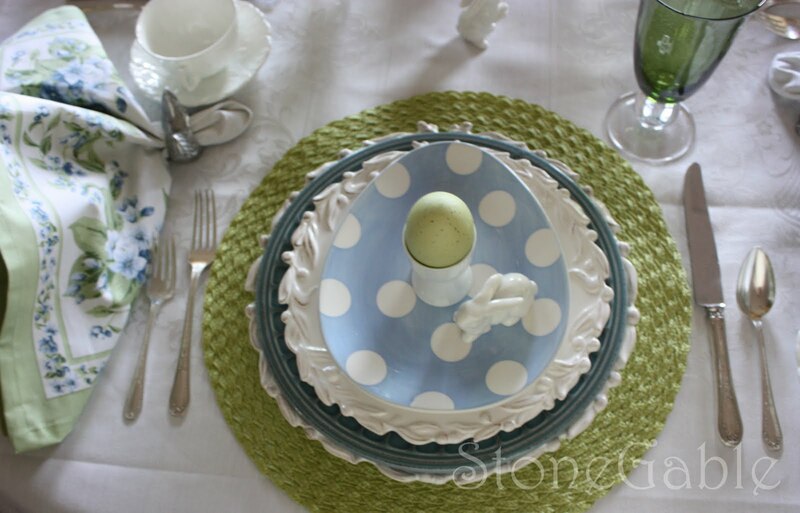 Round colorful straw placemats anchor each place. 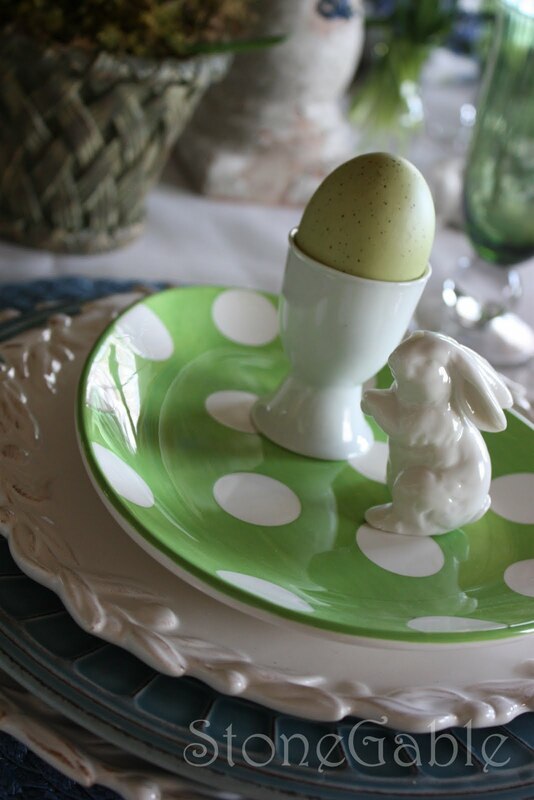 They remind me of the brim of a straw Easter bonnet. 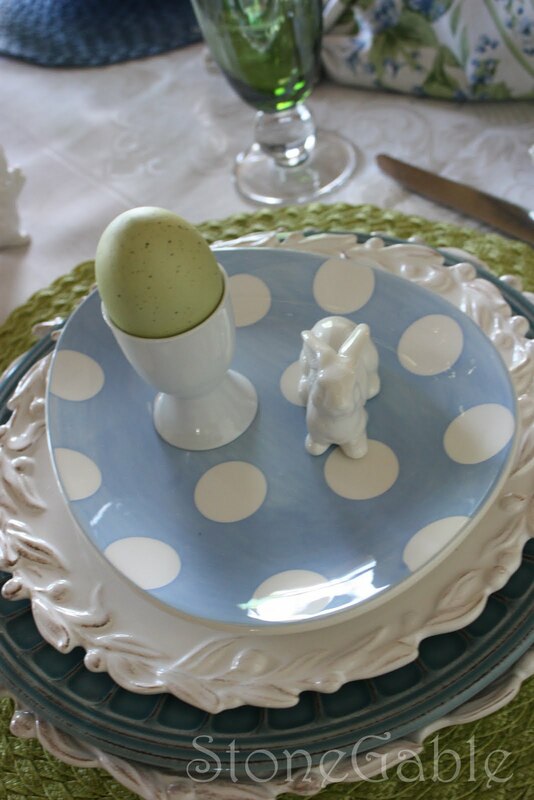 The polka dot egg dishes are topped with a white egg cup holding a green speckled egg and a little white bunny sits quietly beside. 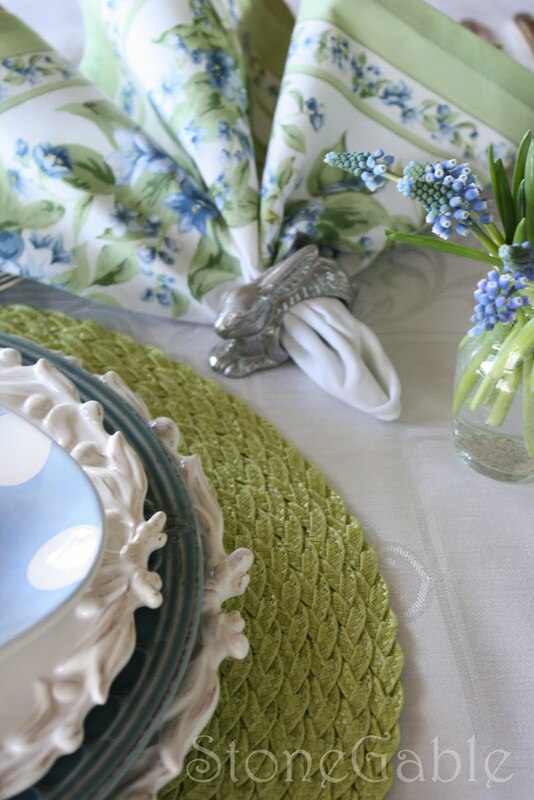 A crisp blue and white floral napkin and a soft green linen-like napkins (HomeGoods) are caught up together in a pewter bunny napkin ring. 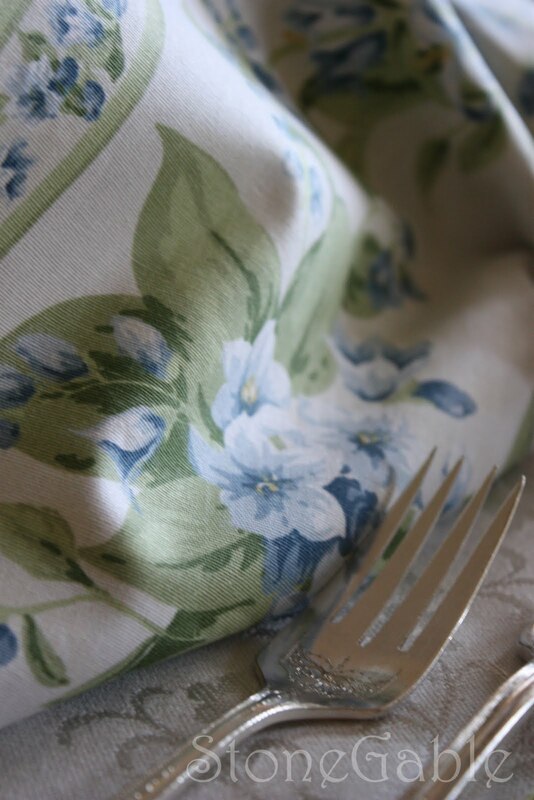 Using two napkins together gives a fancy and full look. 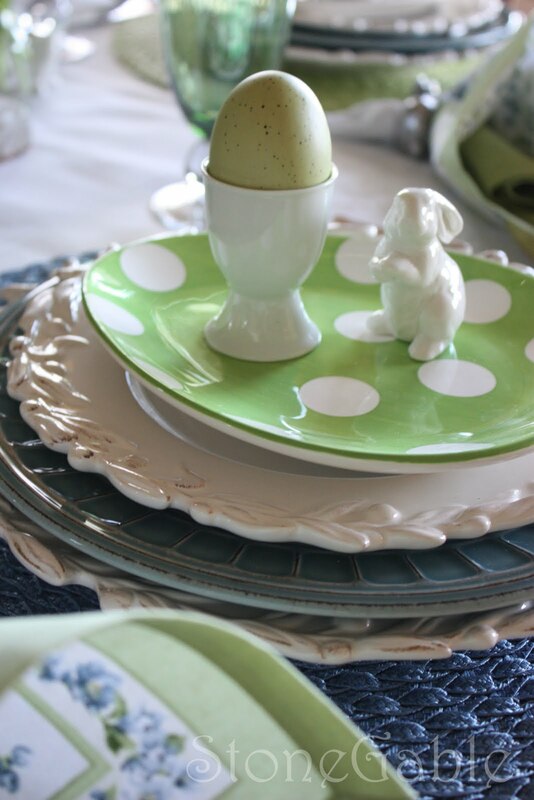 Green ball stem glasses (Target) await an Easter libation. 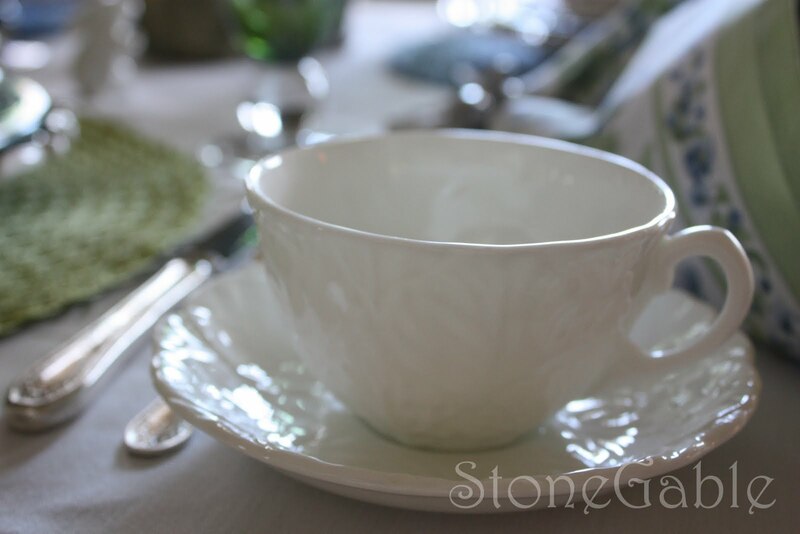 White porcelain tea cups have a leafy pattern. 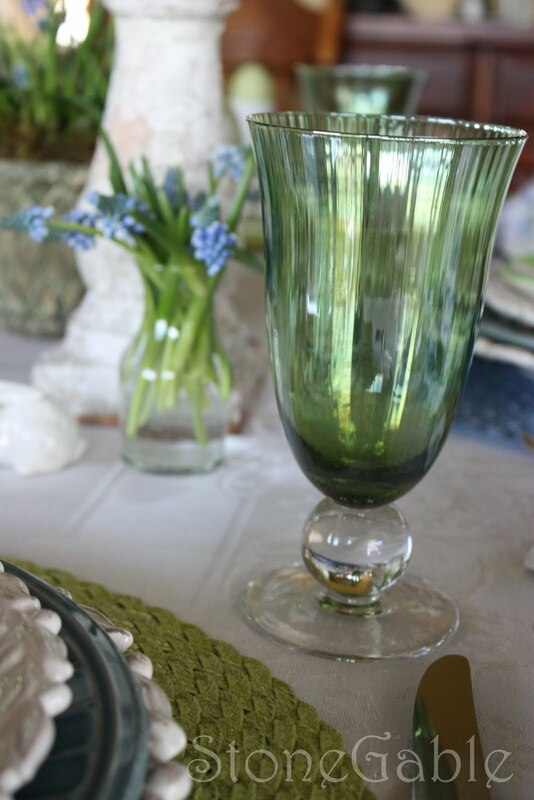 (The Barn antiques) These are so delicate and have become my new favorite cup. 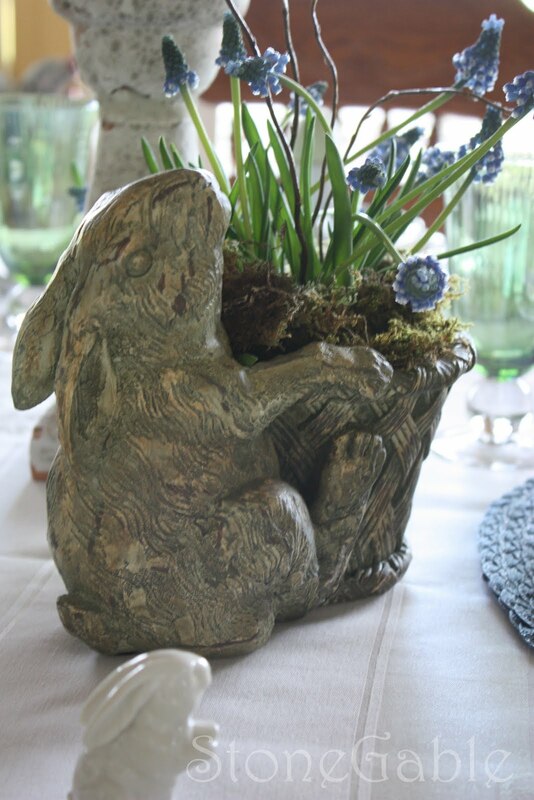 The centerpiece is a worn bunny planter holding a basket of bluebells. 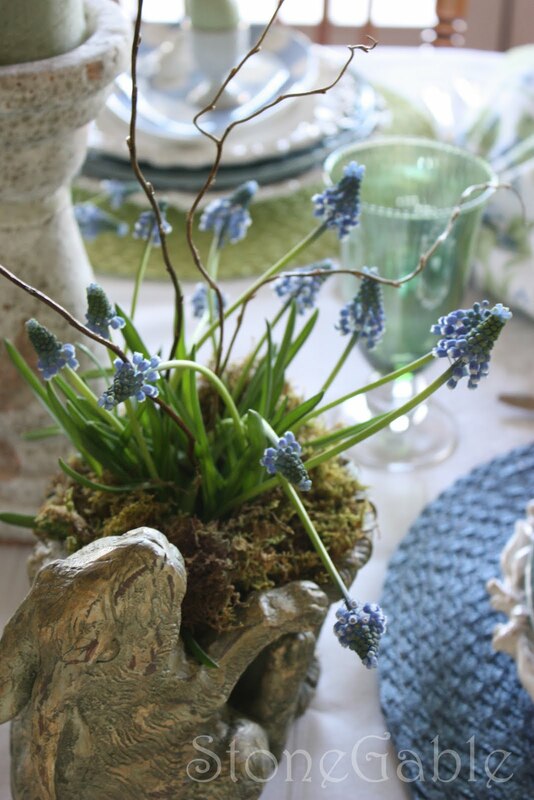 Doesn’t he seem so happy to have a basket of blue spring flowers? 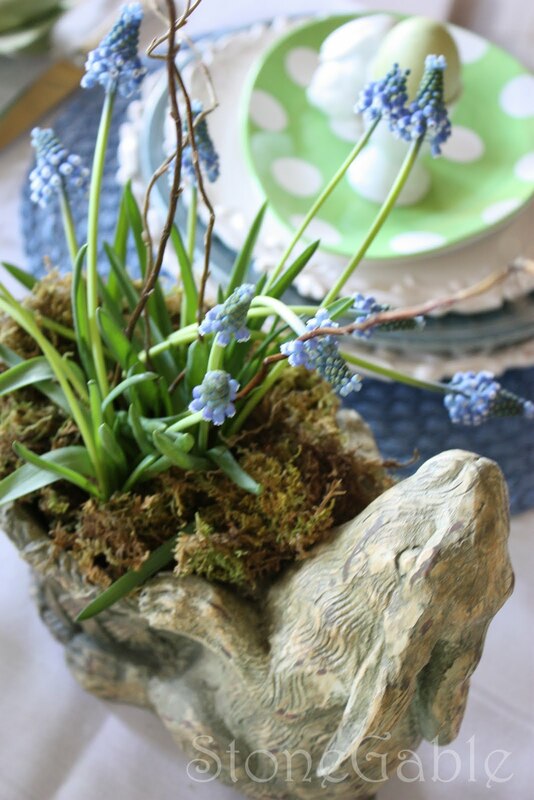 Moss and twigs are added for an earthy feel. 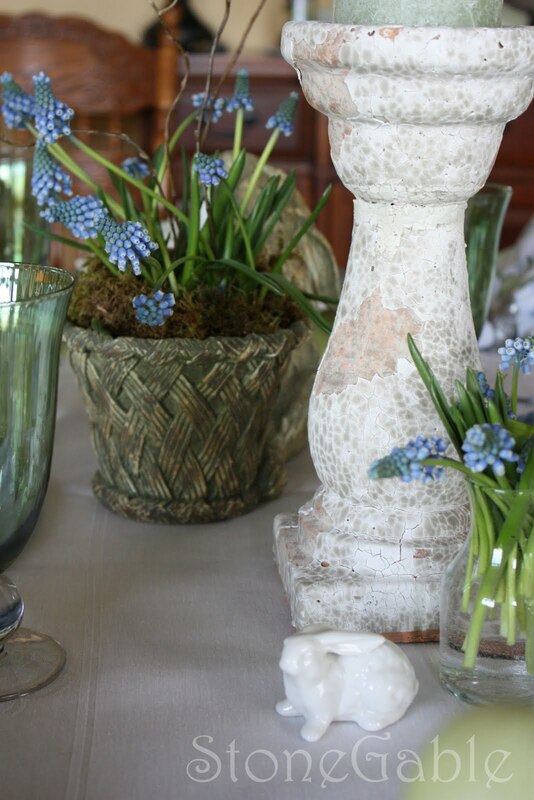 A light green pillar candle sits on top of a plastered white candlestick. 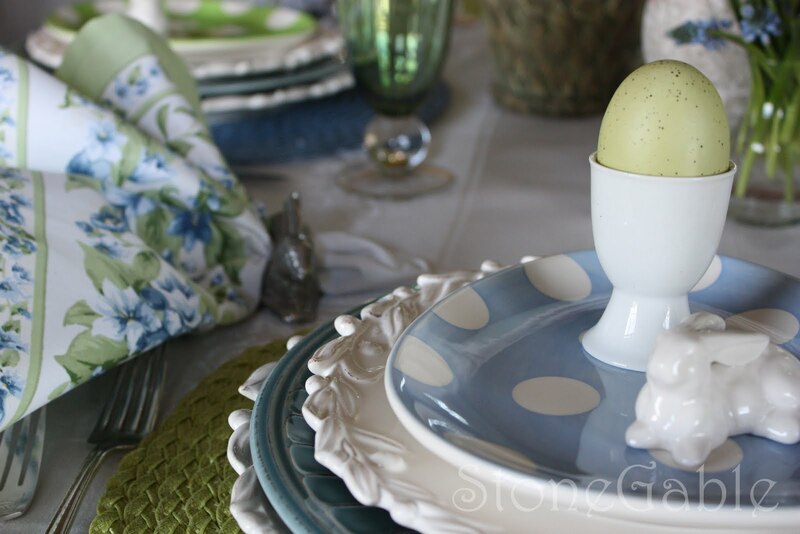 Even though the table is set for brunch, lighting at least one candle makes for a more inviting atmosphere. 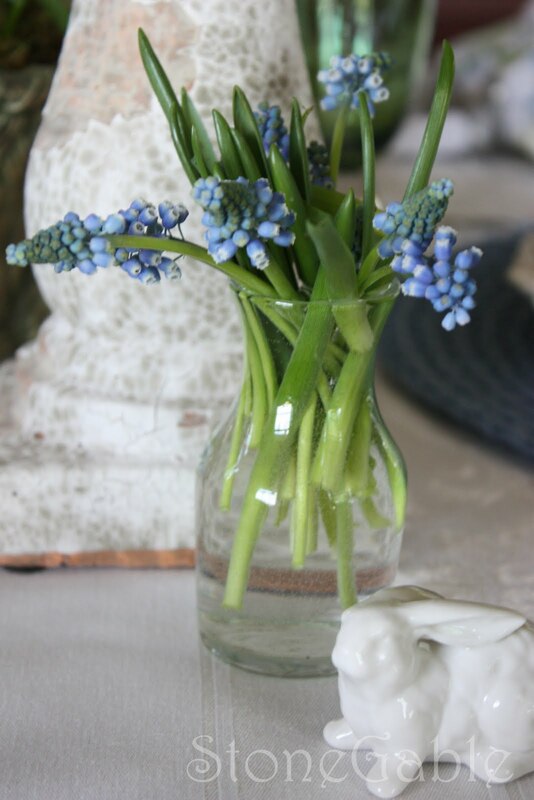 A tiny glass milk jug is used as a vase to hold extra bluebells. 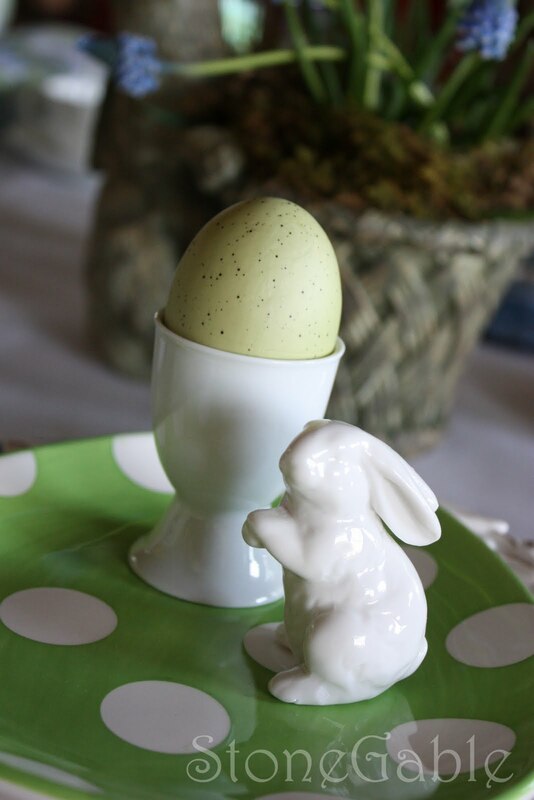 From the bunnies and me have a Happy and Blessed Easter! 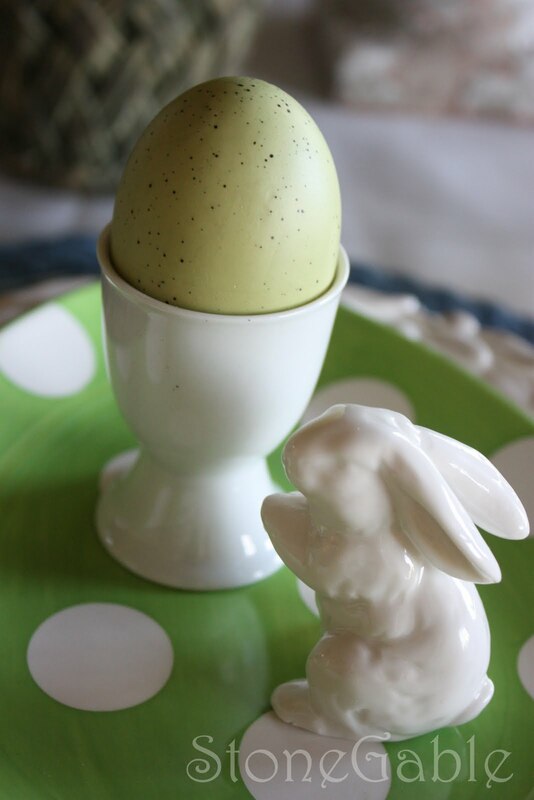 For other amazingly crafty Spring ideas and recipes go here. Hi, I’m Yvonne…a work-in-progress child of God. I’m the mother of 3 beautiful twenty-something children and a recent empty nester. I live with Bobby, my wonderful husband, Scamp our spoiled dog and Hobbes our rascally cat. 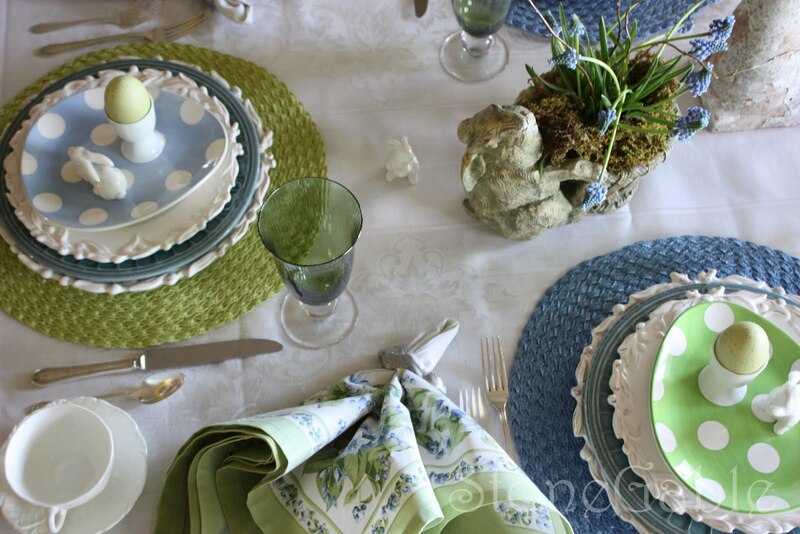 I love all things HOME… well…except ironing and maybe cleaning the garage! 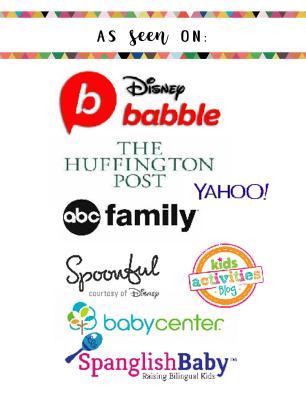 I am a life-long learner on a constant quest to learn and do something new… especially when it concerns anything domestic ! 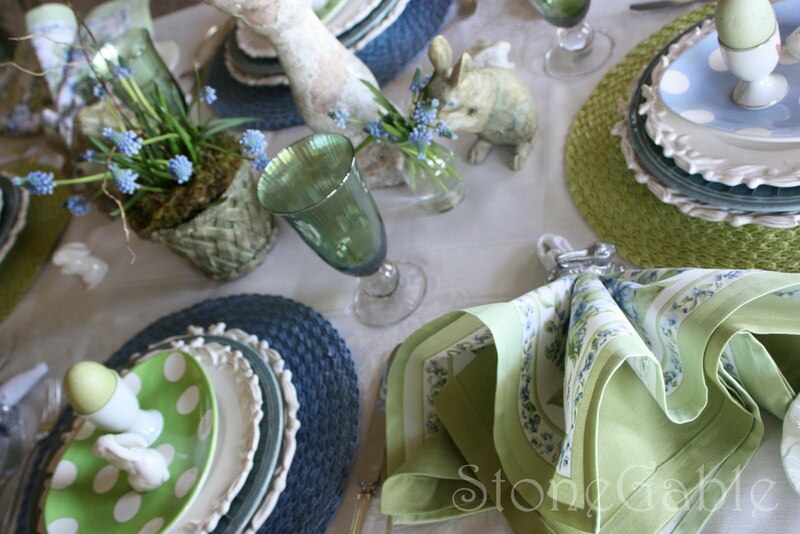 I have a blog called StoneGable that is my creative workshop! 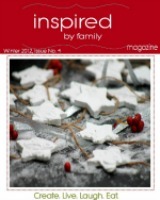 My passion in life is teaching God’s word and speaking to women’s groups. Living by grace, I strive to be positive and purposeful. I want to live large and love life and all those who cross my path.